Much of the buzz for the last few weeks has been over whether Texas Governor Rick Perry will take the plunge and run for the Republican nomination for President. He’s definitely going to run. Well, PGH doesn’t know any more than anyone else. But he is definitely looking into the possibility in a serious way. Perry has been racking up the phone bills (to be paid by Texas taxpayers) trying to find out if joining the race at this point is logistically feasible. For pretty much anyone else the answer would almost certainly be no. For Perry….welllllll. With zero national campaign organization and the Iowa straw poll coming up in only a few weeks, Perry starts with a pretty big disadvantage. But Perry does have a few things going for him. Name recognition: At least among the tea party set, the name Rick Perry is one that is familiar. 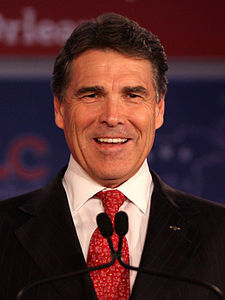 In fact, the reason why he is seriously considering entering the race is because enough high-powered people who are disgusted with the current 10 or so choices for the Republican nomination have been lobbying Perry to run. Still, outside of Texas and tea party circles, most of America probably knows nothing about him…or if they do, don’t necessarily like what they know. RGA: Perry has been a bigwig in the Republican Governors Association for some time and knows how to raise money. With the tea party desperately looking for a messiah (and realizing that Bachmann ain’t gonna be it), they would flock to Perry in a nanosecond. Off course they flocked to Donald Trump in a nanosecond as well, then Herman Cain, then Michelle Bachmann, and so I guess Perry is up next. Cred: While Perry obviously would get the vote of everyone in the tea party, he somehow also doesn’t scare off most not-s0-bigoted mainstream Republicans. Thus he is pretty much the only GOP candidate that could get the vote of both the crazy side and the sane side of the GOP. So if he jumps in, he might just do well even with this late start. Of course, if Perry does enter the race, that means the end of the Michelle Bachmann experiment. Bachmann was all poised to win next month’s Iowa straw poll and would have likely won the February caucuses. With Perry in the mix, she would fade away. [And there is no way Perry would pick her as a running mate if he does get the nomination]. A Perry candidacy would also all but eliminate people like Tim Pawlenty and Jon Huntsman. The impact of a Perry candidacy on Mitt Romney is more uncertain, mainly because Romney is the only actual serious person running for the GOP. That makes Romney the alternative choice if the GOP decides that Perry and the tea party brigade are too dangerous to nominate. So we wait. Frankly, Perry jumping in would significantly change the analysis, so I hope he makes his decision soon. PGH has some politic-crunching to do and it helps if all the nuts are in the bowl before getting started.